The types of survey questions used in a survey will play a role in producing unbiased or relevant survey responses. As the survey designer, consider the types of questions to use and when it is appropriate to use them. Question types range from open-ended (comments to essays) to closed-ended (yes/no, multiple choice, rating scale, etc). In the end, it is the question types that determine what type of information is collected. Sometimes respondents may find it difficult to express their feelings. This can result with respondents answering “I don‟t know” or skipping it. They do take more time and effort to fill out and at times they can have a larger skip rate. In addition, analyzing open-ended comments can be time consuming and difficult. We have aimed to make that process a bit easier for Professional subscribers by offering a few summary spreadsheet formats in Excel, HTML, or downloading individual questions into a PDF. Closed-ended questions are those with pre-designed answers with a small or large set of potential choices. One type of closed-ended question is a “dichotomous” question which allows respondents to choose one of two answer choices (e.g. Yes or No), while another type is the “multi-chotomous” question, which allows respondents to choose one of many answer choices. Ranking questions are best to use when all the choices listed should be ranked according to a level of specification (e.g. level of importance). If you have a question in which you need the respondents to indicate what items are the “most important” to “least important” then you can set up a ranking question. The matrix & rating type questions are used when surveying the frequency of something like behavior or attitude. It is best to present the rating scale in a logical or consistent order. Therefore, it makes sense to order the ranking or rating choices from low to high (e.g. Strongly Disagree to Strongly Agree going from left to right). 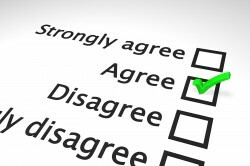 If you set up the rating scale in your survey in this format of “Strongly Disagree” to “Strongly Agree” make sure that the rest of the survey is consistent and all rating scales go from the low to the high frequency throughout (or vice versa). In addition, some surveys may only label the outliers or endpoints of the scale, but it is good practice to assign a label or number to each rating scale. Please note: Some studies have shown that whether verbal descriptors are used only at endpoints or at every scale point, it may affect the distribution of the data collected either way. The two common types of matrix-rating scales are called likert and semantic differential scales. Rating scales are popular ways of collecting subjective data where you want to measure a respondent’s ideas (e.g. opinions, knowledge, or feelings). When creating rating scales, likert scales in particular, consider if you want the scales to be balanced or unbalanced. The following sections discuss these two scales and the difference between balanced vs. unbalanced scales. A likert scale is considered an “agree – disagree” scale. This setup gives respondents a series of attitude dimensions. For each dimension, the respondent is asked whether, and how strongly, they agree or disagree to each dimension using a point rating scale. Likert scales are given scores or assigned a weight to each scale, usually from 1 to 5. The purpose of the likert scale is to sum the scores for each respondent (the response average), and the intent of the likert is in that the statement will represent different aspects of the same attitude. The semantic differential scale is one that has opposite ends of the scale marked with two different or opposing statements. Respondents are then asked to indicate the area in which they fall on the scale. Unlike the likert scale, the semantic types do not have to have a “statement” that is semantically identified for each rating along the scale. It is typically recommended to use a seven–point scale for these types. It is also good to keep the statements on the opposite ends short and precise. A five-point rating scale typically gives sufficient discrimination and is easily understood by survey participants. This is usually recommended for most survey settings. However, there is no set limit on the number of categories to use. Using too few could give less-cultivated information, while using too many could make the question hard to read and answer. Related to this setup is the decision of incorporating a “middle category”. The content and analytical purpose of the question will determine if you want to create a balanced vs. an unbalanced rating scale. If a rating scale is balanced, it means it is composed of an equal number of positive and negative labels anchored by opposite poles, with or without midpoints. Here is where you decide if you want to provide a “neutral” middle category to your scale. If a neutral choice is a possibility, then you may want to include a midpoint answer choice. However, if you want the respondent to take one side over the other, then an even number of categories is suggested. This will force respondents away from the neutral response. Some people agree that it is best to force the respondents in one direction or the other. If you choose the unbalanced form and force respondents away from the neutral alternative, then as the researcher be careful that this will not introduce bias into the data. A good survey design should help to stimulate recall (if necessary); it should motivate the respondent to reply; and the survey should flow in an orderly fashion. The sequence of questions will help to create a certain flow to the survey. This flow will also ease or arouse the respondent’s interest and overcome his/her doubts about the survey’s intent. As a general guideline, there are three areas regarding question sequence: opening questions, question flow, and location of sensitive questions. 1. Opening questions – The first few questions in the survey should be easy and interesting in order to calm any participants’ suspicions about the survey’s integrity. This allows the participants to build up confidence in the survey’s objective. In return, this may stimulate their interest and overall participation. 2. Question flow – The question sequence in the survey body should take on a flow of ideas and be geared towards the respondents’ abilities. After you have established the first general topic, all related questions should come up before a second topic is raised. It is a good idea to use “pages” in the online design to house each different section of the survey. Here you can raise one topic on one page and include the instructions/information for this section in the Page Description area. When you are then ready to introduce a new topic to the survey, you can create a new or second page to include that page’s description and purpose. Conditional or Skip Logic questions are also a good way to control the respondent’s flow or route through the survey. You can apply question or page skip logic to the survey when you want to guide respondents and exclude them from certain pages of questions that do not apply to them. 3. Location of sensitive questions – Some suggest that sensitive questions should not be included at the beginning of the survey. However, there are no set rules on this. If you do include sensitive questions at the beginning of the survey, then you may run into respondents rejecting the survey and exiting early. They may not have built up confidence yet in the survey’s integrity quite so early. Questions like demographics or personal information are usually best to introduce towards the end of the survey. This way, respondents are likely to have already developed confidence in the survey’s objective. When designing your survey structure, the overall format and layout is important from beginning to end. A poorly organized survey may cause respondents to skip questions or completely opt out of answering your survey. It is good practice to begin your survey with an introduction that explains the survey’s purpose. Within the introduction, you may want to include the name of the organization conducting the survey, the confidentiality information, and how the data collected will be used. Many participants like some kind of assurance in regards to their responses; providing that kind of information before the survey starts can help ease those concerns. You may also want to provide an estimate of how long the survey might take or whether you are offering any kind of incentive or prize for taking the survey. Remember to deliver on your promised gift! If you provide this information up front it usually leads to honest responses and more completed surveys. Providing general instructions on how to progress through the survey in the introduction or within each new section is important in letting your audience know how the survey works. From here respondents will not have to look back and forth in the survey to see what they are supposed to do. The use of space throughout the survey is also important. Trying to fit too much information (e.g. too many questions) on a single page may cause respondents to struggle through the survey. If your survey has multiple sections or parts, then it is good to introduce each new section as suggested previously. Keep in mind to make the sections and questions flow in a sequential order that makes sense to the respondents. 1. Make the survey visually appealing and user-friendly. 2. Try not to use small fonts or fonts that are not easy to read. Some participants may have a difficult time reading small print. 3. To avoid clutter, use white space. 4. Ask only one question per line. If it makes sense you can place questions side by side using our tool. 5. Group similar question together or in the same area of the survey. 6. Ask interesting questions in the beginning of the survey to grab the participants‟ attention. This helps to stimulate interest. 7. Place demographic and/or sensitive questions at the end of the survey. If they are in the beginning, participants may opt out early. 8. Finally, test the survey before going live. A small sample of test respondents can help verify if your survey is working properly. This enables you to revise and edit questions and the survey design. Once your respondent has reached the end of your survey, you can create a Thank You page. Here you can thank the respondent for their time. Also, let them know that once they click the “Done” or “Submit” button, their survey response will be submitted. This may help to build rapport with the respondent; possibly increasing the likelihood that they will participate in your future survey invites. 1. Identification – You can add a unique number or identifier to each questionnaire. 2. Numbering – Questions can be numbered sequentially throughout the survey, even if the survey is divided by pages or sections. You can choose to have our tool number the questions throughout the entire survey as a whole or have the questions numbered according to each individual page. This may help you in coding your survey. 3. Instructions – General instructions are important for the administration of the survey as well as for the collection of accurate data. The following two types of information ought to be distinguishable in the survey: questions to be read / answered and instructions to be followed. You may want to customize your survey to include different fonts for the instructions or page descriptions vs. the survey questions themselves. Place any special instructions on either the page description/section or directly above the question itself. 4. Fonts & Formats – If you want to emphasize important words, then underline or bold them in the survey question or page description. This makes it easier for your respondents to identify key points or items. You will need to incorporate HTML code into the survey design to emphasize certain words or phrases. We are only able to offer limited support in your own HTML coding, so knowledge of basic HTML is necessary. The pre-test or test pilot of the survey provides two functions. It first serves as the initial “live” test of the survey, and secondly it is the last step in finalizing the survey questions and form. The pre-test is possibly one of the most critical steps in administering a survey. By opting out of conducting a test pilot, you could jeopardize the accuracy of the data. The test pilot offers feedback on whether the survey’s wording and clarity is apparent to all survey respondents and whether the questions mean the same thing to all respondents. 1. To evaluate the competency of the questionnaire. 2. To estimate the length of the survey or time to take the survey. 3. To determine the quality of the surveyor.